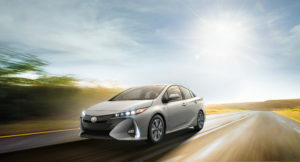 It’s early days yet, but Toyota is considering making every future Prius a Prius plug-in hybrid. That’s the word from Shoichi Kaneko, assistant chief engineer for the 2017 Prius Prime plug-in. He dropped that tidbit during a dinner conversation Tuesday at the press preview of the new Prius plug-in hybrids. The 2017 Prius Prime – which goes on sale in late November in all 50 states – delivers 25 miles of all-electric range and superb estimated fuel economy of 54 mpg (combined) at substantially less cost to the consumer than other PHEVs. After a $4,500 federal tax credit it is even cheaper than the standard Prius hybrid. The Prime replaces the discontinued Prius Plug-In Hybrid built off the 3rd generation platform and introduced in 2012. The Prime also features an exterior design that greatly improves on the looks of the standard fourth-gen plugless Prius hybrid introduced last year. Given the budget-friendly price and impressive fuel efficiency of the new Prius Prime, Kaneko was asked, when do all Priuses (or Prii) get plugs? “We are considering it” for the next generation of the Prius, he replied though a translator. With the plugless 2016 Prius liftback hybrid already delivering an estimated 52 mpg, improving fuel efficiency in the future will be “a large challenge,” Kaneko said. Making the popular hybrid a Prius plug-in hybrid “is one way to do that,” he said. Because a plug-in hybrid, or PHEV, uses a much larger battery pack than a conventional hybrid – a pack that is initially charged from the commercial power grid – it delivers substantially more all-electric driving capability. For the average driver who makes mostly short trips during the work week, rarely dipping into the gasoline engine, a PHEV can double or even triple the overall fuel efficiency of a standard hybrid. There is no certainty about the future direction of the Prius – the next new generation is still three to five years away – public acceptance of the 2017 Prius Prime will go a long way to influencing Toyota’s decision makers. “It is the first step to take on that path” to an all-plug-in lineup, said Kaneko.